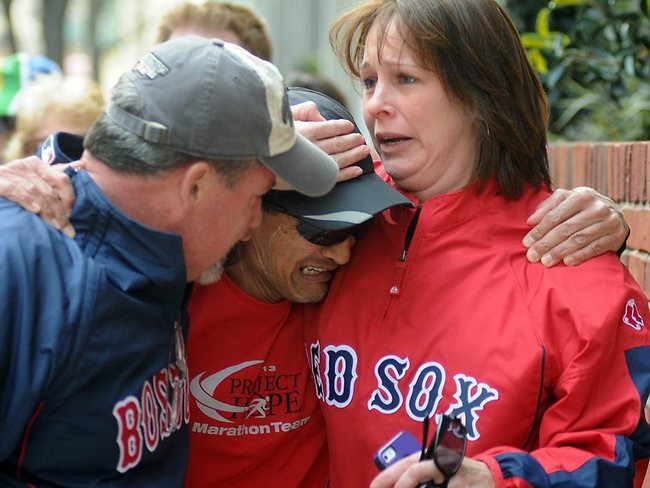 I don’t remember exactly where I was or what I was doing on April 15, 2013, when I learned two bombs had exploded near the finish line of the Boston Marathon, killing three people and injuring more than 250 others. And I don’t remember exactly how I processed and reacted to the news, other than that moment joining the macabre list of drop-everything-and-turn-to-CNN incidents that stay with you for years: Columbine, 9/11, Sandy Hook, Hurricane Katrina and the like. What I do remember most clearly about the Boston Marathon bombings are the feelings I had days later, after the investigation zeroed in on brothers Dzhokhar and Tamerlan Tsarnaev, when it was first reported that the brothers were Muslim and that the bombings were suspected to be a terrorist act motivated by an extremist interpretation of Islam. I felt sick. I felt sad. I felt panicked. I felt injured. I felt the same as millions of Muslims around the United States and the world felt upon hearing the news. Except at that time, I was not a Muslim. In April 2013, I was what you might call a student of Islam. I had been exploring the religion from afar for at least a decade, and the more I learned, the closer I moved toward converting. But I wasn’t there yet. By the time April 2013 rolled around, I felt like I knew Islam. I felt like I wanted to become a Muslim. But so far I had not definitively felt like a Muslim. As the Boston Marathon bombings story developed, I realized that as bad as I felt for the victims and their communities, I also felt for the community of the accused. Because whatever negative feelings and biases mainstream society and media expressed toward Muslims before the Boston Marathon bombings, they were only about to get worse for the Islamic community. And I felt like part of that community. Do you ever have those moments when you hear some bad news, or you realize someone is doing something crazy or embarrassing in public, and you hope with all you have that the culprit doesn’t have anything in common with you? That they don’t look like you? That they aren’t the same race or gender as you? That they didn’t come from your hometown, go to the same school, or work in the same industry as you? Because you know that if there’s any link between you and the culprit, a lot of people will use it to think negatively of you, even if you have nothing to do with the situation at all. Up until April 2013, I had only experienced that feeling in relation to my race and my gender. And to a less-serious extent, my city. I had never experienced that feeling in relation to my religion — mostly because I’d never really had a religion. But learning that the men who were possibly behind the Boston Marathon bombings were Muslim and may have used a distorted version of Islam to drive their actions not only gave me that feeling; it gave me that feeling in a way that I hadn’t remembered before. It was stronger. The Boston Marathon bombing and aftermath provided an undeniable clarity that, at my core, just as strongly and proudly as I called myself a Black man from Seattle, I should also be calling myself a Muslim. Three months later, I took my Shahada: I bear witness that there is none worthy of worship except Allah, and I bear witness that Muhammad is his prophet and messenger. One year after the Boston Marathon bombings, while the 2014 race looms (April 21) and the surviving Tsarnaev brother awaits trial, not much has changed as far as public opinion and media portrayals of Muslims. There is still a widespread belief, especially in the U.S., that Islam and terrorism are naturally linked. What can the Islamic ummah do to fight against such misconceptions? Also important is working to impact change within the Muslim community and reaching young people before they can be swayed into following the wrong path. Working to eradicate poverty and promote education in the Muslim community is the key to that. The link between crime and poverty is obvious, as is the link between poverty and a lack of education. There is also this: With education comes a greater understanding of things like politics and policies — simply knowing how the world works. That knowledge, as well as being in good economic standing, creates freedom and options for any individual. In short, the number of young Muslims who are raised in conditions that allow them to fall under bad influences would go down if the Islamic community brings up its financial and education resources. Which is not an easy job or a quick fix by any means. But it is necessary and worth working for. Minister Louis Farrakhan of the Nation of Islam said as much during a recent speech at Olive-Harvey College in Chicago. The men and women (and boys and girls) who are committing bad acts in the name of Islam — while they are making their own choices — have been failed by the community at large. Not just by the Muslims with bad intentions who influence their actions, but also by the Muslims who are not there to show them another way and set them on the right path. The truth of the matter is that the best chance of preventing the Boston Marathon bombings of 2013 presented itself years earlier, before those responsible took their first steps down a wrong path from which they didn’t come back.